Army Ants (also known as Legionary Ants) is a blanket term that covers 200+ species of ants. They are easily identified by the way they swarm in large numbers. Army Ants do not make permanent nests. You can spot these ants much more easily than other types of ants because they are much more noticeable in their large groups. 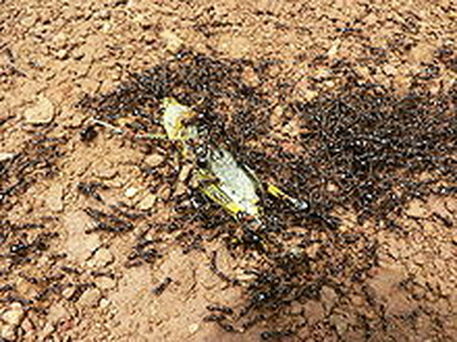 Army Ants will eat a wide variety of food. They attack other insects (like beatles, caterpillars and grasshoppers) as well as clean up any dropped food. They will also invade other ant colonies and eat their eggs. Even stinging bugs like wasps are not immune to the invasion. How do Army Ants get into my home or business? All it take is one to start the infestation, then the rest will follow. The first ant finds food in your home and brings it back to the group, then a large portion of the group will follow the first ants trail back into your home, most often the kitchen, and before you know it you are being invaded. How do I get rid of Army Ants? The first step in getting rid of Army Ants is to remove the food source and clean the area, but you will need to contact a professional (that's us!) to exterminate the nest so they will not keep coming back. Give us a call and we will be more than happy to help you with your ant infestation! Click here to learn more about Big Headed Ants!